Here is Part 2 of 'An Army at War' hope you enjoy. In 1939 The World was once again plunged into war. This time however, The Salvation Army would find itself fighting it's own personal battle for survival. Persecuted, divided and attacked like never before. The man to guide the Army through this crisis was the 5th General, Australian George Carpenter, who took office on 1st November 1939 as the world and the Salvation Army was dragged into the Second World War. The worldwide Army was torn apart, as communication with International Headquarters in London became almost impossible, conscription severely diminished it's active adult manpower, evacuation effectively ended children's work in the UK's urban areas, and many older members in the UK took on voluntary service in the Home Guard, Air Raid Precaution Wardens etc. Blackouts, destruction of Corps and other wartime constraints and protective measures devastated what was left of congregations. On the night of May 10th/11th 1941 tragically, and almost symbolic of the Army's problems; International Headquarters itself was almost totally destroyed in an air raid by German bombers. The Army in the UK was down but not out, continually on the streets doing what they could to assist emergency services and all those affected by the devastation. This was an Army damaged, hurt and weakened, but still committed to 'Serving Suffering Humanity' wherever and whenever they could. The Salvation Army in mainland Europe faced an even more direct and imminent threat as the third Reich marched ever onwards and nation after nation fell under Nazi occupation and ongoing devastating conflict, as Europe continued to tear itself apart. In order to keep this post relatively short here's just a short breakdown of how the Army fared in occupied Europe and the East. Please feel free to join the conversation with stories, context, opinions and any additional information in the comments section. - Finland was devastated by a long and bitter war against Russia, joined forces with Nazi Germany but ultimately fell to Russian occupation. The Army continued it's work as best it could until early 1942 when the Finnish government officially advised the Army leaders to evacuate. - Norway and Denmark were occupied in 1940, Army work continued but hampered by buildings being requisitioned for military purposes, curfews, blackouts, arrests and so on. - Belgium and Holland saw arrests, the suppression of 'the war cry', deportation of Salvationists to Germany for forced labour. - France was split in two by the capitulation of compiègne in 1940, communication between occupied and unoccupied France was forbidden, serving Salvation Army officers were imprisoned. Major George Flandre was betrayed and shot. When the rest of France fell, the Salvation Army was effectively disbanded; meetings and uniforms were forbidden, Army properties were seized and sold by the state. There was some hope though. Monsieur Marc Boegner president of France's Federation of reformed Churches allowed Army meetings to be held in his own Churches and incorporated the Army's social services programmes into their own Churches. Ironically Germany's Territorial Headquarters was severely damaged in an air raid by allied forces. - Switzerland remained neutral but did everything it could to support the suffering and displaced, with financial aid and the housing of refugees, even at the cost of severing it's own ties with International Headquarters in London. - Japan, Singapore, Indonesia, China and Korea all suffered harsh treatment, arrests, subjugation, attacks, formal dissolution and amalgamation into a state run, controlled, monitored and regulated, religious organisation. A brief word about my home city of Coventry, known today as the city of peace and reconciliation. On the night of 14th November 1940 the German air force devastated this city including the heartbreaking destruction of our Cathedral and most of the city centre. It has left a permanent scar on our city and identity. A German newspaper of the time apparently described Coventry as 'the hate filled, victory assured symbol of the absolute destruction of an enemy city'. 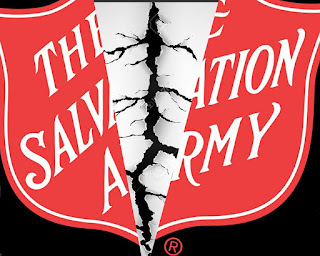 How could anything survive what the Salvation Army went through during the Second World War? How could this damaged and broken Army ever march as one? But by the Grace of God, it did. It returned, it healed, and it grew. 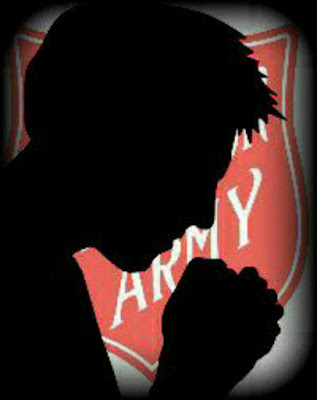 The Salvation Army pulled together, in every corner of the world. Relief teams from Britain, America and Sweden flooded Europe, Corps were rebuilt, Flags donated, Salvationist brothers and sisters from around the world lifted each other up in love, kindness and fellowship. If such darkness and evil can be overcome, then anything can. In these times, when hatred and suspicion seem to be on the rise, take heart in this reconciliation, rebuilding and hope that whatever the future holds, this Army and the God it serves can and will endure.